Tallahassee area: Gadsden, Leon and Wakulla County, Florida Tallahassee area: Gadsden, Leon and Wakulla County, Florida U-Pick farms: Find a pick your own farm near you in Tallahassee area: Gadsden, Leon and Wakulla County, Florida for fruit, vegetables, pumpkins, organic foods,local produce and more! Looking for a local, pick-your-own farm in Tallahassee area: Gadsden, Leon and Wakulla County, Florida? Scroll down this page and you will see the U-Pick farms in Tallahassee area: Gadsden, Leon and Wakulla County, Florida, sorted by county. Those that offer organic or sustainably grown produce are identified by the words "organic" and/or "sustainable" in Green, next to their name (see "What does Organic mean?"). The U-pick crops they offer follow the name of the farm. To search the page for a specific crop, use Ctrl-F (or on an ipad or Mac, use their "search on this page" function) If they have a website, the name will be in blue and underlined; click on it and it will open their website. If you find anything outdated or inaccurate, see the customer and farmer menus (as appropriate) at the top menu bar to submit updates and corrections and help me keep each current! 7858 Havana Highway (state Road 12w), Havana, FL 32333. Phone: 850-539-5346. Fax: 850-539-5346. Email: [email protected]. Directions: north of Tallahassee, Florida about 15 miles. head north from Tallahassee on US 27, to Havana, turn left at the first traffic light, It is State Road 12W go west toward Quincy 1 1/2 miles our road is Beare's Blueberry Lane. Turn left. And for a map to our farm, Click here. Open: Beare's Berries U - Pick, sunrise to sunset,7 days per week; We grow everything naturally, without any poisonous sprays or chemical fertilizers; We are applying for "Certified Naturally Grown" designation and expect to have it soon. We use natural practices, but are not yet certified Organic. Our blueberries are the "rabbiteye" type, which grows well in the South. Payment: Cash, Check. We have a Porta Potty available. Iced Drinks at a reasonable cost to the pickers. Comments from a visitor on June 14, 2009: "I noticed that someone commented on Beare's Farm that when they went, no one was there and they were upset because the listing says sunrise to sunset. I have been to that farm and want to point out that they work on the honor system. So if no one is there, they have buckets out and a scale, and you pick your blueberries, weigh them, and leave the money in the receptacle they provide. I have been several times when no one was there and did this." A visitor reports on July 4th, 2008: "Drove all the way out to Beare's farm and not a sole was there! This was at 1:00 in the afternoon on a Friday. Not happy being gas is $4.00 gallon. They said open 7 days a week sunrise to sunset"
8101 Blue Star Highway, Quincy, FL 32352. Phone: 850-856-5967. Email: [email protected]. Open: Sunday through Saturday 8:00am to 8:00pm June - July. Directions: Highway 90 west on the right just past the Talquin water tower at Oak Grove. Click here for a map and directions. We use natural practices, but are not seeking organic certification. Payment: Cash, only. 2210 Liberation Lane, Tallahassee, FL 32308. Phone: 850-386-5880. Email: [email protected]. Open: Essentially Daylight hours for until late August. Directions: Centerville road at I-10. Follow signs. Click here for a map and directions. Payment: Cash, Check. Welder grapes are usually available for 3 weeks in late August to mid September, but they are starting and finishing early in 2012. Payment: Cash, Check. 975 Oak Ridge Road E, Tallahassee, FL 32305. Phone: (850) 421-0057. Email: [email protected]. Directions: coming from the red light in Woodville, go west on Oak Ridge Road toward Wakulla Springs Road. Drive about 1 mile, 3 black mail boxes on the righthand side of the road, just before the double curves and double curve sign. The yellow "no passing" stripe will begin on the road and our driveway is on the left. It is a long dirt lane. Our signs are at the road pointing to our driveway if we are open. Crops are usually available in August, September, October. Open: Monday through Friday 6pm til dark, weekends 7am til dark; Please call to be sure we are home. End of August through mid-October. Payment: Cash, only. We have muscadine grapes, Carlos (bronze) and Noble (purple) varieties. We also have some Welder and Doreen which ripen closer to the end of the season. We charge $1 per pound. If you want more than 30 pounds we will negotiate a fair price. 7007 Roberts Road, Tallahassee, FL 32309. Phone: 850/524-6435. Alternate Phone: 850/322-1848. Email: [email protected]. Open: NOTE: Their website is gone; Does anyone have current information, are they still offering pick your own or are even open? If so, please write me, their last reported hours were The pecan orchard is a CASH ONLY operation; Pecan picking season is from October through December; Generally, we are open from dawn until dusk, 7 days a week; Pecan picking will be closed Thanksgiving Day. Directions: Click here for a map and directions. On rare occasions, pecan picking is closed to allow more nuts to fall; However we do not foresee 2015 warranting a close date. We use natural practices, but are not seeking organic certification. Payment: Cash, Check, Debit cards, Visa/MasterCard. Click here for our Facebook page. The Historic Roberts Family Farm hosts a community garden with plots available for monthly rental. We are home to what we believe to be the largest hugelkultur in the area and coming soon, enrollment in our food forest guild! Contact us for more details. 57 Valley Rise Rd off Bob Miller Rd. Woodville Area., Crawfordville, FL 32327. Phone: 850-421-1627. Open: 7 days a week; from 7am till dusk. Directions: From Woodville Hiway and Summerhaven Dr. turn right on Summerhaven, go one block, turn left on the Old Woodville Hiway, go approximately one block and take a right on Bob Miller Road Go approximately 1and a quarter miles to Valley Rise Road Follow the road back and take the left driveway follow signs back behind the rustic house. Click here for a map and directions. Opening Date is usually the first of June; Please call closer to season for specific date. We use natural practices, but are not seeking organic certification. Payment: Cash, Check. some garden vegetables: Tomatoes, eggplant, squash bell peppers, and collards. We have everything you need for your picking pleasure. Buckets for picking, bags for carrying your berries home, and most of all plenty of big juicy berries. Also called Saladino's Red Barn Farm. . Comments from a visitor, April 16, 2008: "We love it and return every year!! Steve and Tina are so friendly and know the history and variety of each bush. The blueberries are plum and the field is very well maintained"
Comments from Blake, July 7, 2016: "There are reviews (all positive as of this date) on their unofficial Facebook page. 252 Wakulla Springs Road, Crawfordville, FL 32327. Phone: 850-228-7942. Email: [email protected]. Open: Tuesday to Friday from 7am to 10 am and from 4pm to 7pm, Saturday and Sunday from 7am to 7pm, closed on Monday; Our season will start about Mid June and run through mid July. Directions: From Tallahassee: 319 south to 61 south (it exits to the left about 3 miles south of Capital Circle). We are about 4 miles after this turn, one half mile inside Wakulla County on the right. From Crawfordville: 319 north, right on 267 (Bloxham Cutoff), left on 61 (Wakulla Springs Road). We are 3 1/2 miles up on the left. Click here for a map and directions. Payment: Cash, Check. Click here for our Facebook page. None of our crop is sprayed with pesticides and we have not used herbicides. We were awarded the Innovative Agricultural producer award 2012 for Wakulla County based on our method of installation which conserves water and chemical use. 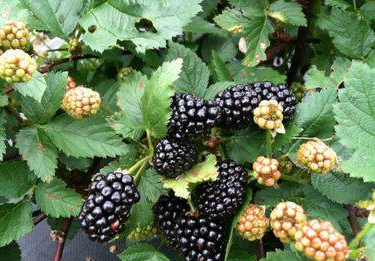 We have 780 plants (3000 linear feet) of two varieties of thornless blackberries, Natchez and Ouachita. Both are excellent.